The 3-5 Brooklyn Nets head to the City of Angels to play the 6-3 LA Clippers tonight at Staples. Coach Jason Kidd and the Brooklyn Boys are coming off their first road win of the young season after Joe Johnson sank the winning basket at the buzzer for a 100-98 OT W in Phoenix. Also contributing to the victory were C Brook Lopez, who tied his season-high with 27 points, and 19th-year Kevin Garnett, who hauled in a season-high 14 boards. Though the dramatic, come-from-behind win was an important get for the Nets, it was also costly. PG Deron Williams left the contest in the first quarter after spraining his left ankle. In his stead, veteran 1-guard Shaun Livingston came in to run the offense and scored a season-high 18 points in 37 minutes. Late in the fourth quarter Lopez and Garnett collided with one another. Williams and Lopez along with small forward Paul Pierce (sore left groin) will all miss tonight’s 48, while Garnett will be a game time decision. The Clippers last played on Wednesday night at home, besting the OKC Thunder 111-103. Blake Griffin had 22 points, 12 boards and 7 assists while his fellow co-captain Chris Paul went for 14 points and 16 dimes. Amazingly, Paul has reached double figures in both categories in all 9 of LA’s games so far. Coach Doc Rivers’ squad is averaging a league-best 110 points per game and has yet to lose at home. 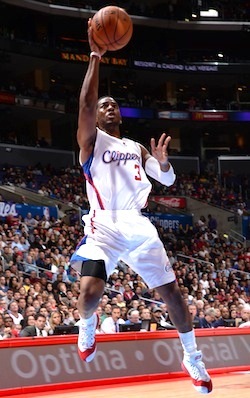 In fact, at Staples the Clips are averaging 120.8 ppg, which is also best in the NBA for a home court average. But on the other side of the court, the Clippers are allowing 106 ppt, which puts them at 29th in the league. This number is sure to improve considering Rivers’ emphasis on and history of coaching advanced team D.
Though it looks like the reunion will be postponed, Coach Rivers was prepared to get a potent dose of his own medicine from former pupils KG and LA native Pierce. This trio competed together for six seasons in Boston, winning the 2008 Championship and being minutes away from winning Game 7 in 2010. In other words, there’s lots of shared history for these three. Brooklyn is off to a somewhat disappointing start after all their off-season acquisitions and the accompanying buzz. By picking up super-veterans KG, Pierce, Jason Terry and Andrei Kirilenko this summer, many prognosticators proclaimed this Nets team ready to dethrone LeBron and the Heat. However, it’s still mid-November and this roster was formulated with May and June in mind. A Nets win tonight would be encouraging on many levels considering this is the second night of a road back-to-back and that the Clippers are on a hot streak and have yet to lose at home. Tune in to the YES Network at 10:30 PM ET to see if Brooklyn can come away with another big W despite being shorthanded.